Four weeks ago, pat self on back for making the best matzoh balls in the family. This is why you are always asked to make them. Remember last year when you cracked the matzoh ball production code: make batter two or three weeks in advance, form into balls and freeze. Turn iPod to Pandora mariachi station and go into Mexican music-inspired production trance. The night before the seder or the morning of, simply drop frozen kneidlach in salted boiling water. Congratulate self on hyper-organization and serene ability to get everything done. You will arrive at seder with freshly blown out hair and perfect matzoh balls. One night before, complain silently that you are the only one who everyone always calls on to make hundreds of repetitive, time-consuming, somewhat fiddly food: matzoh balls. Tamales. Cupcakes. Mojitos. Move things out of the way on counter. A month ago, anticipated prep consisted of clean counter. empty except for a bowl of lemons and the KitchenAid. Recall somewhat belatedly that KitchenAid has been unreliable. Tell self it will probably be OK. The problem is the housing of the spinning mechanism. Remember that a few weeks ago it worked perfectly as long as it ran on high speeds. No problem. You’ll beat eggs, water, schmaltz on high speed, then add matzoh meal by hand. Put off making matzoh ball batter in order to help son with homework. Put off making matzoh ball batter because the cat wants dinner. Put off making matzoh ball batter because you just don’t feel like doing it. The kitchen’s a mess. You meant to do this two weeks ago. You could be sitting around watching House of Cards and eating cake-batter Peeps if you’d planned better. Measure and season matzoh meal. 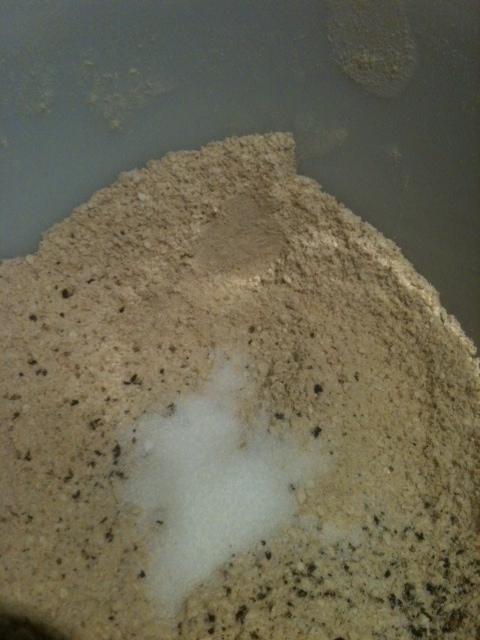 Salt, black pepper, tons of powdered ginger. Sneer at directions on matzoh meal box that suggest a teaspoon of salt IF DESIRED. Bask in the family recipe for matzoh balls. 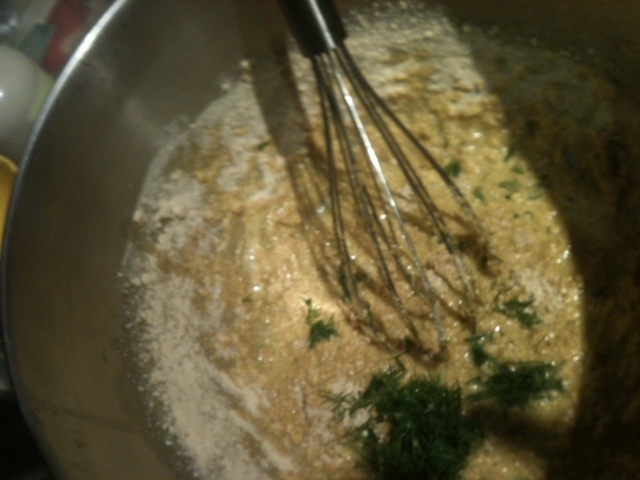 They have, someone said, the taste of Passover: ginger, a little fresh dill. Schmaltz helps, too, and don’t stint. 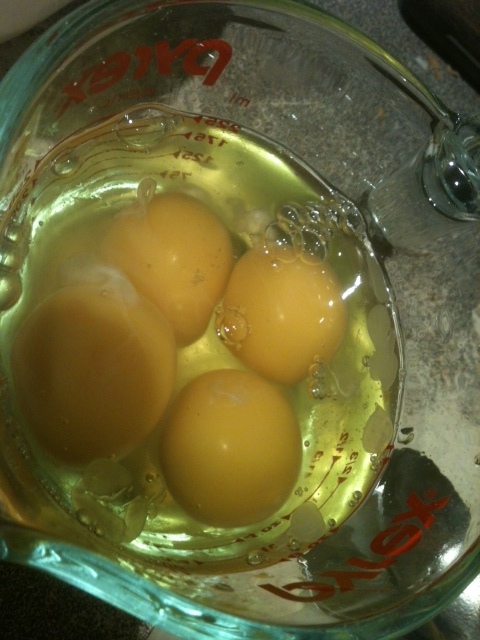 Break eggs into measuring cup. Feel tiny bit of thrill at the sight of double yolks, then tiny bit of horror at slight suggestion of blood spot. Is that a blood spot? Is it? A shadow? Eggs with blood spots aren’t kosher. An embryonic chicken is forming, so it’s no longer a pareve food that can be eaten with either milk or meat. Remember that the seder is a meat meal. So it’s OK. All right, it’s not a blood spot. Also realize that one grandmother (in Brooklyn) would have just beaten the eggs by hand with a whisk or an eggbeater, the other grandmother (on the border of Juarez in Texas) had full-time Mexican help. And before she moved to El Paso she would have just beaten the eggs by hand. Fume about KitchenAid charging hundreds of dollars for an appliance that used to last thousands of years, and now lasts about five. Note that piece that holds the whole spinning thing is GLUED in. Why not screwed in? As in how they are screwing their customers? 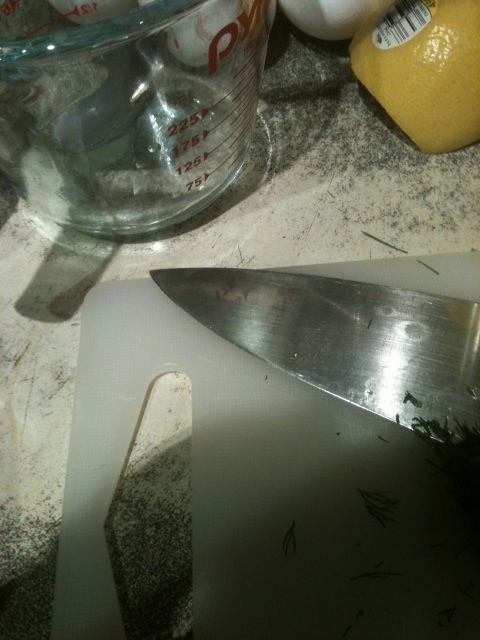 Finish beating eggs and water and schmaltz by hand, so irritated that beating fast and furiously is pretty easy. Add seasoned matzoh meal. Decide to take a few pictures. Can’t write about food these days without a picture. Realize there is an unavoidable shadow in the picture (yourself, probably) because of the angle of the kitchen ceiling light. 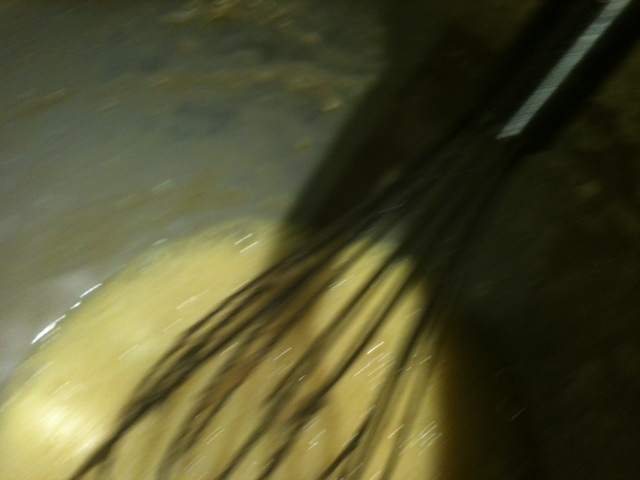 Also realize that matzoh ball batter is unphotogenic in the extreme. Angrily answer potential critics of crummy food photos and start flinging Yiddish around in your irritation: “I’m making kneidlach batter, not taking fancy pictures!” Try to remember some cutting Yiddish phrase or insult, but remember only the words for busybody and whore. Feel you have more in common with your dead ancestors with every passing year. They, too, would have been shocked that KitchenAid makes such a drekky mixer. They would have lost patience with photographing the dish they were in the middle of making. They would laugh at the idea that a tiny bit of salt is enough to season matzoh balls. They would also be making matzoh balls the day before the seder, because when else would you do it? Two weeks ago in your chametz-filled kitchen? In fact it’s the day before Passover and your kitchen is, in fact, still filled with chametz, though you did fill a shopping bag with elbow pasta, a canister of Quaker Oats, several boxes of pasta and some cake mix. This goes to a neighbor’s house so she can use what she likes. You admire the emptier shelves. But a top to bottom cleaning? Sigh heavily. Remember that one grandmother had Rosa to help her. The other probably didn’t do that much because she wasn’t that observant. Send younger son to the park to get a feather, and that night, sweep a little ritual pile of crumbs off the counter into a wooden spoon and burn it. After the holidays, plan to contact KitchenAid and make them realize how very, very wrong they’ve been to allow this drop in quality. Maybe call them gonifs. Plan to make matzoh balls earlier next year. At least a week before. Maybe two. Realize the Passover food marathon is always going to bring on a storm of sighing, mariachi, Yiddish cursing and commemorating family members present and past, observant and not so observant, cooking in cast iron or in dented, light-as-a-feather aluminum cookware that nevertheless generated a brisket to die for, or matzoh balls with flecks of green dill and the scent of ginger.